Rain Man that features no rain dance, I was very dissapointed! Fast-talking yuppie Charlie Babbitt is forced to slow down when he meets a brother he never knew he had, an autistic savant named Raymond (Dustin Hoffman, in an Oscar-winning role) who’s spent most of his life in an institution. When their wealthy father dies, leaving everything to Raymond, Charlie takes his unusually gifted older brother on a life-changing cross-country odyssey that neither is likely to forget. Rain Man is one of those films that just look OK but then out of nowhere becomes amazing. This certainly happened to me as I was expecting a OK film, when what I got was one of the most touching films I have ever seen. The film starts out as a normal drama fest packed with a lot of strong drama dialogue but then out of nowhere turns into a road- film that ends up being a heart warming comedy. Director Barry Levinson, makes a premise we have all seen before and change it into something totally new and fresh. His direction is impressive in that some scenes that are very serious actually turn out to be quite funny and without this the film would’ve been a total bore fest. I also think that Levinson’s screenplay works as not many of the lines are cliched and very witty and actually very quotable. I did have some problems with Rain Man however. I didn’t like how this film focused a lot on Cruise’s character as I really didn’t like him and find him as appealing as Hoffman’s, and I felt this took away a lot of what could’ve came to this film. I also didn’t like the little side story of Cruise being all against his father. It was so your typical bad guy hates father motive that is way too over-used and I though really wasn’t need as many others. The one thing to acknowledge in this film is that throughout Cruise is trying to change Hoffman, since he doesn’t like how he is weird and autistic, and by the end of the film Hoffman ends up changing Cruise. This film has a lot of reality that all the people you see are real, and nothing will change about them. Hoffman gives one of the greatest performances of his career as Raymond, and shows he can be any character. Mostly to his deliverance of the lines, Hoffman makes this film watchable with his witty lines, and just overall his very believable look into a new person. I also liked how Hoffman didn’t act like a stereotypical autistic. He didn’t talk funny, he didn’t say weird stuff, he was just awkward and different and that’s what I like about this film. Tom Cruise believe it or not, actually does not get upstaged in this film. In every scene it seems like Hoffman and Cruise are just trying to one up each other with these two obviously different characters. 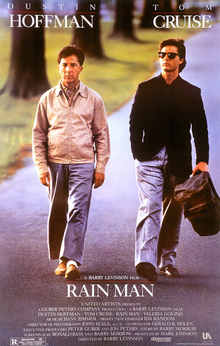 Consensus: Though you have seen it before, Rain Man is an impressive and witty look on family values, and features some strong messages with two very strong performances from Cruise and Hoffman.